We are on the verge of transforming one of society’s most fundamental building blocks: manufacturing. As new technologies enable manufacturers to customize everything, these same agents are quickly turning consumers into inventors. Following the Agricultural Revolution some 5,000 years ago, humanity made a huge breakthrough that allowed complex societies to flourish: we specialized. It made no sense for each of us to make all our everyday products and bear the cost of necessary building equipment. So soon enough, we had our neighborhood shoemaker, carpenter, silversmith and tailor. Fast forward several thousand years, and large corporations have created vast new product lines and amplified output. We can now fabricate the same product over and over again millions of times, using assembly lines, labor-driven megafactories, human-operated machinery and more. But today, technological convergence is closing the historical loop. While we used to specialize based on manufacturing ability and availability of tools, these constraints are about to disappear. 1. 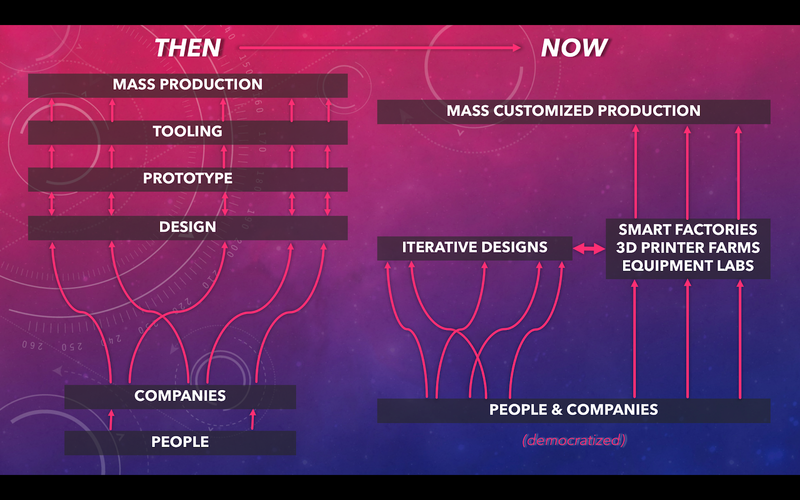 Mass Customization: As fixed costs begin to reach variable costs in the production sphere, companies will no longer fabricate millions of the same product or part. Customer data-driven design will allow for tailor-made commodities, and one-off production will be just as cheap. 2. Democratized Invention: Incubator studios and fabrication equipment labs are jumping onto the scene. Flaunting AI-aided robots and swarm 3D printers that work overnight, these urban workshops basically serve as your new testing ground -- the physical hands for your digital designs. Forget operational costs, fabrication equipment, prototyping, tooling and far-flung production plants. Whether in-house or entirely outsourced, design-to-production technologies allow anyone to invent. 3. Smart & Autonomous Factories: Already own a manufacturing plant aiming to meet production quotas? Industrial IoT (IIoT) and smart factories are ushering in a new era of autonomous production, minimizing recall risk and freeing corporations to design expanded product lines. Technological convergence will soon allow startups and corporations alike to personalize products at unparalleled scale. Autodesk envisions that AI will go from merely automating production to custom configuring products to meet individual demands. But perhaps the greatest driver of customized manufacturing at scale is 3D printing. Add to this masses of consumer data and AI, and millions of one-off, tailor-made products are already flooding the market. Previously a niche and prohibitively priced tool, 3D printing is hitting its exponential growth phase this year. In 2015, the additive manufacturing industry grew to almost $5.2 billion, and over a quarter million 3D printers under $5,000 each were sold globally. By 2021, IDC analysts expect 3D printing global spending to be nearly $20 billion. With newly accessible design software, we can customize anatomy-conforming stents, personalized dentistry products, adapted airplane and auto parts, or microscale fabrication products such as sensors, drug delivery technologies, and lab-on-a-chip applications. Launching their first release just this past year, Carbon 3D and Adidas are applying athlete-specific data and individual cushioning preferences to 3D print the perfect midsole for every runner. Using the interface of light and oxygen, Carbon 3D prints solids from liquids in record time, controlling elasticity, strength-to-weight ratio, and countless other mechanical and material properties. But printing methods don’t stop there. In a previous blog, we talked about MX3D, a Dutch company printing steel bridges with remarkable structural integrity. Now, MX3D is using its six-axis robotic arms to 3D-print the Arc Bicycle, a futuristic bike with steel lattice frame. Potentially the greatest breakthrough in its manufacturing process is MX3D’s multiple-axis printing capability, which enables printing from any direction in mid-air. While conventional 3D printing requires some form of support for objects as they’re printed, multi-axis printing technologies almost entirely eliminate this dependency, opening up incredible new structural possibilities. In the past, smart products and electronics had to be manually embedded with circuitry. Not anymore. Using a wide array of conductive inks, new players are printing circuitry directly into their products, all in one go. Entering a new age of customized and on-demand electronics, startups like NanoDimension and Voxel8 use conductive inks to print advanced circuits. With high thermal stability and at only a few microns thick, evolving conductive inks have the potential to revolutionize hardware production. Forget lengthy design processes, multi-stage prototyping, costly tooling, and uniform production. At plummeting costs, 3D printing takes us directly from design to production, where design becomes adaptable and production is expedited by orders of magnitude. In Peter's 6 D’s of exponential growth, a technology truly goes exponential when an accessible user interface emerges. Democratized platforms are the name of the game. With newly accessible CAD-like design software and easy-to-use interfaces, everyone can be an inventor. While both cheap and advanced 3D printers are close to entering your home, a new ecosystem of hardware studios and eager accelerators is springing up across urban centers. Leaping to collaborate with digital startups and designers, companies like Playground Global and LulzBot are growing to provide the physical building space and manufacturing capacity for now unfettered entrepreneurs. Think about this: with the growth of such a movement, any manufacturer wanting to build any product can become completely dematerialized. Andy Rubin, creator of Android mobile’s operating system, wants to take care of material constraints like engineering, fabrication, supply chain management and distribution with Playground Global LLC. Providing in-house expertise in exchange for small equity stakes, Flex’s Lab IX helps dozens of startups build transformative technologies -- think drone systems, super-thin batteries, and sensor-equipped headbands that can calm or energize your brain. Bigger players, like 3D Systems and Stratasys, are also embracing distributed manufacturing. 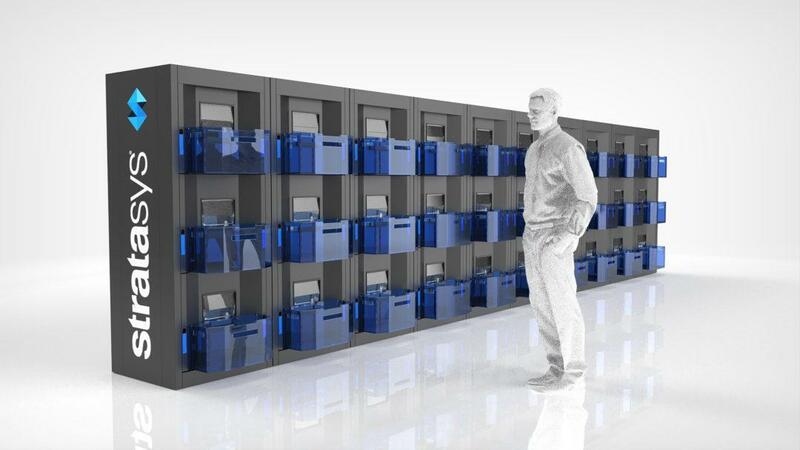 With its Continuous Build 3D Demonstrator, Stratasys supplies countless 3D printers, all working simultaneously and centrally controlled through a cloud-based architecture. While venture capital firms like Bolt use similar prototyping equipment labs to support those startups entering Y Combinator and other accelerators, crowdfunding sources like Kickstarter look to give entrepreneurs a leg up through initial finance. When talking about the 3 billion new minds joining the web as Internet connectivity blankets the earth, I’ve asked: what will these new consumers want? Now we can ask: what will today’s new inventors build? As distributed manufacturing converges with the plunging costs of automated fabrication, we are about to see an explosion of innovative design. For established corporations with high production quotas, Industrial IoT, AI, collaborative bots, and new technologies like Li-Fi are the next frontier. You’ve heard of the Internet of Things, whereby device connectivity allows smart products to communicate seamlessly and automate cumbersome tasks. But who better to manufacture smart products than smart factories? With new sensors, ML tools and inspection drones coming onto the market, not only can manufacturing equipment correct for errors instantaneously, but production will conform to changing demands in real time. A leading player in IIoT, TE Connectivity is one of many building sensors used to communicate data between equipment and smart devices. Targeting everything from the medical sector to appliances to aerospace and defense, TE’s products enable machine-to-machine (M2M) communication. Long-term, they hope to supply factories capable of adapting to workflows in real time. In more isolated regions, M2M communication is particularly liberating as it allows for decentralized data transfer between smart bots. Companies like Filament are aiding this movement with low-power industrial sensors and blockchain. Others, like Kepler Communications, use satellite-based solutions for isolated production plants, leveraging a space-based communication network for industrial sensors. Aiming to eliminate the risk of recalls -- one of the most costly and dreaded catastrophes for big manufacturers -- new players also bring AI to the rescue. Silicon Valley-based startup Landing.ai now produces machine-vision tools that can find microscopic defects in circuit boards and products hidden from our visual range. With precise on-site quality analysis, errors are communicated immediately, and IIoT-connected machinery can halt any output before it ever becomes a liability. But what about defective machinery? Startups like Instrumental, Maana and Augury Systems have you covered. As predictive analytics are engineered to a T, startups using machine learning techniques can detect abnormalities and risky indicators long before they cause issues. Offering a full suite of sensors, Augury Systems piggybacks off IIoT to analyze machinery’s acoustic fingerprints and identify defects before they occur. Yet as cloud-connected, collaborative machines begin managing themselves, what’s to stop fully automated factories operating in the dark or without heat? 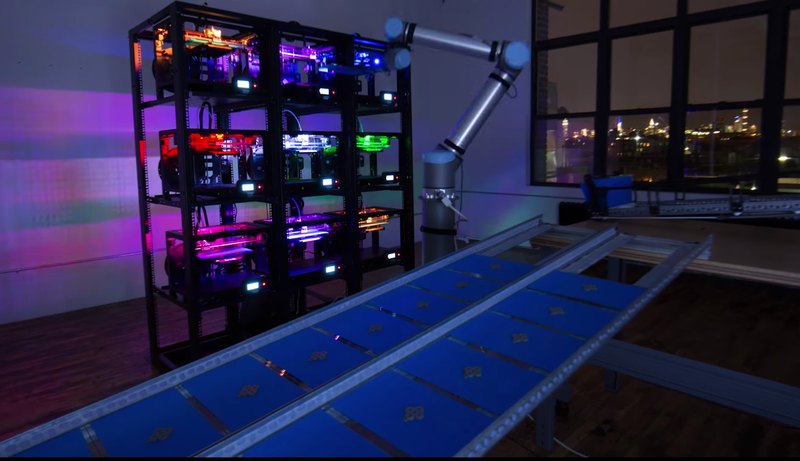 Geared with nine mounted 3D printers and a huge robotic arm, Voodoo Manufacturing is massively disrupting 24/7/365 production with Project Skywalker. We see a staggering convergence of 3D printers, collaborative 3D printing farms, co-robots, robots that manage 3D printers, 3D printers that build robots… and this is just the beginning. Smart sensors now convert data, communicate with fabrication machines, and turn off devices when performance or safety are at stake. IIoT allows us to analyze production quotas, do predictive maintenance and input designs remotely. And as price points plummet while accessibility soars, manufacturing behemoths and burgeoning startups alike have a world of opportunity ahead. Although many fear the job market losses caused by purely automated and smart manufacturing, democratized tools and dematerialized companies will allow anyone a shot at invention. This means an upsurge of self-employed, creative minds building needed products; on-demand personalized commodities built at record speed; and an economic boom of unprecedented dimensions. We’ve seen a skyrocketing software industry, bringing millions of jobs and brilliant services to our economy. As physical constraints to fabrication disappear and design platforms abound, we are on the verge of a second boom. (1) A360 Executive Mastermind: This is the sort of conversation Peter explores at his Executive Mastermind group called Abundance 360. The program is highly selective, for 360 abundance and exponentially minded CEOs (running $10M to $10B companies). If you’d like to be considered, apply here. (2) Abundance-Digital Online Community: Peter has also created a Digital/Online community of bold, abundance-minded entrepreneurs called Abundance-Digital. Abundance-Digital is Peter’s ‘onramp’ for exponential entrepreneurs – those who want to get involved and play at a higher level. Click here to learn more.